Good Design is a science, an art and a lifestyle for us. The art is in translating the essence of your identity, visually. The science is in the varied media that we use to do so, and the lifestyle is our commitment to you and your business in every effort we take on your project. Good Design is our business. For the Start-Up business we offer a package designed to meet all your identity and marketing needs right out of the box. Our Turn Key Package includes an original logo design, a logo manual with CD Rom, business stationery design, a tri fold or bi fold brochure design, a brochure type website, domain registration and hosting. When you integrate your marketing communications, you build a stronger brand and a stronger company. A company with increased customer recognition. Our talented staff will design your Advertising from the Logo Design and Brand Identity through all phases of your Marketing Plan right throught to the Point of Purchase experience. We create compelling designs that integrate and support your brand identity. Our design talent and thorough knowledge of all things visual, combined with marketing prowess, allows us to offer designs in printed media that are informative, dynamic and effective. Add excellent copywriting and quality printing resources to the mix and we're able to provide you with high impact printed pieces that get results. Our range of services includes just about every item that you might need to present your company at a Trade Show, Seminar or Convention setting. We design full scale environments as well as smaller Table Top presentations, Give away items, brochures and sell sheets. We also offer complete packages to ensure that your exhibit is integrated with your marketing. 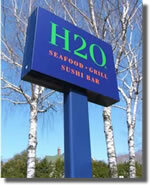 Our company started, 20 plus years ago, as a sign company. Over the years our design strengths and advertising expertise sharpened and we transitioned into a company that provides all facets of visual communications. Our roots in the sign industry remain and while we no longer fabricate signs "in house", we design and facilitate the fabrication of signs for our clients all over the world.